Purified Water, Glycerin, Sorbitol, Ethyl Alcohol, Sucrose, Saccharin Sodium, Artificial and Natural Grape Flavor, FD&C Red #3, and FD&C Blue #1. Based on a review of this drug by the National Academy of Sciences-National Research Council and/or other information, FDA has classified the indications as follows: "Possibly" effective: For use as adjunctive therapy in the treatment of irritable bowel syndrome (irritable colon, spastic colon, mucous colitis) and acute enterocolitis. May also be useful as adjunctive therapy in the treatment of duodenal ulcer. IT HAS NOT BEEN SHOWN CONCLUSIVELY WHETHER ANTICHOLINERGIC/ANTISPASMODIC DRUGS AID IN THE HEALING OF A DUODENAL ULCER, DECREASE THE RATE OF RECURRENCES OR PREVENT COMPLICATIONS. in patients with known hypersensitivity to any of the ingredients. PHENobarbital is contraindicated in acute intermittent porphyria and in those patients in whom phenobarbital produces restlessness and/or excitement. Donnatal® Elixir can cause fetal harm when administered to a pregnant woman. Animal reproduction studies have not been conducted with Donnatal® Elixir. If this drug is used during pregnancy, or if the patient becomes pregnant while taking this drug, the patient should be apprised of the potential hazard to the fetus. Donnatal® Elixir may produce drowsiness or blurred vision. The patient should be warned, should these occur, not to engage in activities requiring mental alertness, such as operating a motor vehicle or other machinery, and not to perform hazardous work. Do not rely on the use of the drug in the presence of complication of biliary tract disease. Animal reproduction studies have not been conducted with Donnatal® Elixir. There is positive evidence of human fetal risk based on adverse reaction data from investigational or marketing experience or studies in humans, but potential benefits may warrant use of the drug in pregnant women despite potential risks (see WARNINGS). It is not known whether this drug is excreted in human milk. Because many drugs are excreted in human milk, caution should be exercised when Donnatal® Elixir is administered to a nursing woman. Elderly patients may react with symptoms of excitement, agitation, drowsiness, and other untoward manifestations to even small doses of the drug. Adverse reactions may include xerostomia; urinary hesitancy and retention; blurred vision; tachycardia; palpitation; mydriasis; cycloplegia; increased ocular tension; loss of taste sense; headache; nervousness; drowsiness; weakness; dizziness; insomnia; nausea; vomiting; impotence; suppression of lactation; constipation; bloated feeling; musculoskeletal pain; severe allergic reaction or drug idiosyncrasies, including anaphylaxis, urticaria, and other dermal manifestations; and decreased sweating. Acquired hypersensitivity to barbiturates consists chiefly in allergic reactions that occur especially in persons who tend to have asthma, urticaria, angioedema, and similar conditions. Hypersensitivity reactions in this category include localized swelling, particularly of the eyelids, cheeks, or lips, and erythematous dermatitis. Rarely, exfoliative dermatitis (e.g. Stevens-Johnson syndrome and toxic epidermal necrolysis) may be caused by PHENobarbital and can prove fatal. The skin eruption may be associated with fever, delirium, and marked degenerative changes in the liver and other parenchymatous organs. In a few cases, megaloblastic anemia has been associated with the chronic use of PHENobarbital. PHENobarbital may produce excitement in some patients, rather than a sedative effect. To report SUSPECTED ADVERSE REACTIONS, contact VistaPharm, Inc. at 1-888-655-1505 or the FDA at 1-800-FDA-1088 or www.fda.gov/medwatch. PHENobarbital may be habit forming and should not be administered to individuals known to be addiction prone or to those with a history of physical and/or psychological dependence upon drugs (see WARNINGS). In patients habituated to barbiturates, abrupt withdrawal may produce delirium or convulsions. The signs and symptoms of overdose are headache, nausea, vomiting, blurred vision, dilated pupils, hot and dry skin, dizziness, dryness of the mouth, difficulty in swallowing, and CNS stimulation. Treatment should consist of gastric lavage, emetics, and activated charcoal. If indicated, parenteral cholinergic agents such as physostigmine or bethanechol chloride should be used. Pediatric patients: may be dosed every 4 to 6 hours. Use a pediatric dosing device or oral syringe to measure the dose. 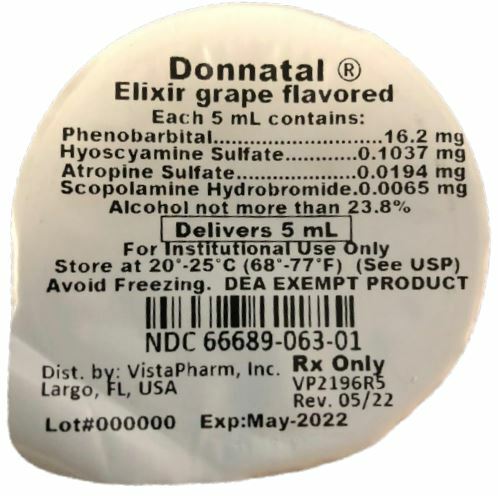 Donnatal® Elixir - Grape is a purple colored, grape flavored liquid. NDC 66689-063-01: 5 mL unit dose cup. Store Donnatal® Elixir at 20º- 25ºC (68º - 77ºF) [see USP Controlled Room Temperature]. Protect from light and moisture.